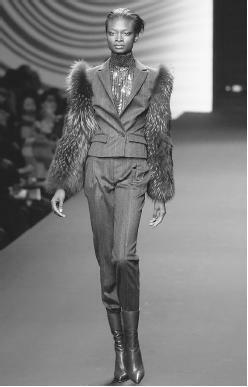 Erreuno SCM SpA, fall/winter 2001-02 collection: suit with fox fur sleeves. Erreuno Uomo line, 1985; Erreuno Jeans collection, 1986; Graziella Ronchi Cocktail line, 1986; Erreuno Golf lines, 1989; Erreuno J line, designed by Michael Kors, introduced in U.S, 1990; launched first fragrance, 1994; signed with Guaber Group to license fragrances, 1995; second fragrance launched with fall ready-to-wear line, 1996; Guglielmo Capone hired as stylist. Company Address: Via Bensi 6, 20152 Milan, Italy. Haber, Holly, "Erreuno J Makes U.S. Debut in Dallas," in WWD, 15August 1990. "Cosmoprof Exhibit Fragrance Launches," in Cosmetics International, 10 May 1994. Barone, Amy B., "Eurocosmesi's Worldwide Plan," in WWD, 9 June 1995. Erreuno SCM SpA, fall/winter 2001-02 collection. Muir, Lucie, "Italian Designers Bring Body Conscious Looks Center Stage for Spring/Summer 1997 with High-Tech Fabrics," in WWD, 18 September 1996. Dichter, Peter, "Vegetable, Mineral, Celebrity: Is Name Alone Enough to Sell a Fragrance?" in Global Cosmetic Industry, October 2000. Erreuno is the brainchild of Ermanno and Graziella Ronchi, who established the company in Milan in 1971. The company name is a combination of the pronunciation of the first letter of the Ronchi name R (Erre) and Uno, the Italian word for one, chosen because it was the couple's first business venture. The Ronchis wanted to create something influential and significant in the Italian fashion world, to establish a company that provided top quality ready-to-wear designs for the smart, modern, and discerning woman. Extremely positive in their approach, their success has been the result of hard work, commitment, and teamwork. Ermanno handles all the administrative and financial side of the business while Graziella oversees design and marketing. Fabric is of prime importance in any Erreuno collection. Designing often appears to be a grouping together of expensive fibers, textures, plaids, prints, mattes, and shines, then coordinating these into wearable, sporty, classic clothes. Graziella Ronchi places great emphasis on fabric research and over two-thirds of the fabrics are developed in the firm's Milan studios. Great care is given to the choice of fabrics used in each collection to ensure that, when made into garments and styled together, they give a strong visual impact and provide versatility of choice for a wide variety of women. Never at the cutting edge of designer fashion, Erreuno instead evolves its own particular style each season. A feeling for softness combined with architectural design is reflected in each individual garment and, when incorporated as part of an outfit, adds its own contribution to the finished look. Erreuno's initial success was in the design and manufacture of skirts. The range expanded and developed to include complete womenswear outfits and in 1975 led to a seasonal ready-to-wear collection, shown twice a year in Milan. Since then the company has steadily evolved to incorporate many other goods: leathers, wallets, foulards, key pouches, bags, hats, and gloves. Sold in worldwide boutiques, the products give customers the opportunity to coordinate an Erreuno outfit with top quality accessories, adding greater credence to the company's marketing strategy. Erreuno collections provide a refreshing presence on the Milan catwalks. Perched midway between the extremes of Dolce & Gabbana's expensive vamps and Giorgio Armani's exquisite classicism, the Erreuno look is one of neutrality. A softly tailored tiny-check suit is teamed with a belted, collarless blouson, an oversize ankle-length, belted mackintosh is teamed with shorts, subtly playing on long and short, or an understated mix of stripes in an outfit comprised of four different types of stripe. Color for Erreuno is soft and discerning; the beiges, browns, creams, lilacs, off-whites, or warm greys are never loud or unflattering. In the mid-1990s the Ronchis segued into fragrance, with their first scent for women aptly named Erreuno. Although many fashion firms were producing fragrances, Erreuno differed in that the floral scent was not licensed but created in-house under the supervision of Graziella. The Ronchis decided to pursue further fragrances, however, forming Erreuno Parfums and signed a licensing agreement with the Guaber Group in 1995. A second women's fragrance debuted with the firm's ready-to-wear collection in the fall of 1996. The expression and imagination of Ermanno and Graziella Ronchi, combined with their flair for design, marketing, and manufacturing, have found the perfect complement in their company. Erreuno and its major lines, Erreuno, Donna Erre and Miss Erreuno, play a pivotal role in Italian fashion, whether through strong showings in Milan or the special identity the firm's clothes create for women.